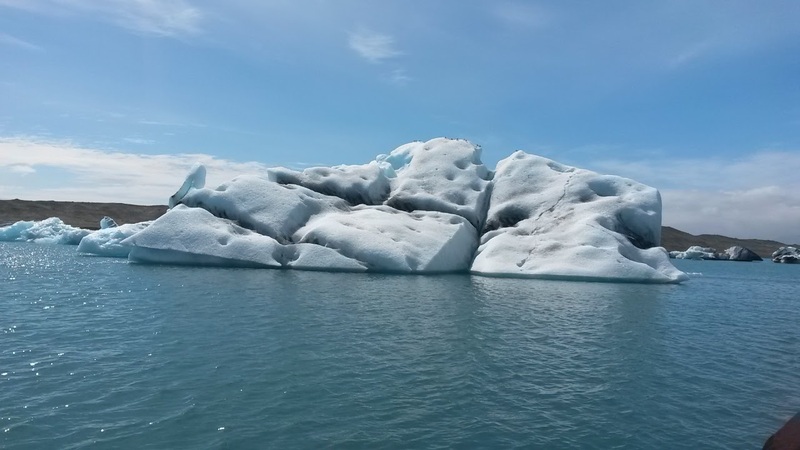 While traveling around the country we stopped at the south eastern coast to visit the glacier lagoon known as Jökulsárlón. The lagoon was created as the large glacier, Breiðamerkurjökull, receded from the coast line. I first got to explore the coast which was covered with smaller icebergs that had washed ashore. The ice was super clear and I even tried tasting them, but they just tasted like normal ice. There was some large pieces of driftwood on the shore that we ate lunch on. Wood is a rare commodity in Iceland because of the few naturally occurring forests, so driftwood is actually a large source of lumber in the country. Some of the turf houses that we visited or artists we saw in museums were built from driftwood. The saturation of salt water helps the wood strengthen which becomes a great construction material. 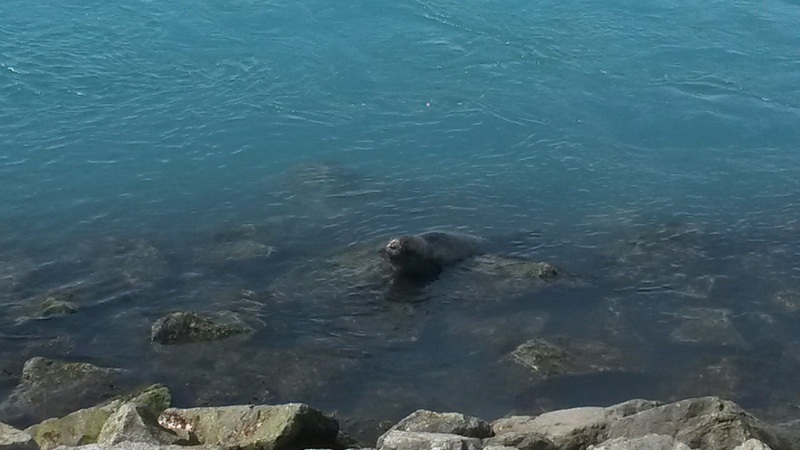 Walking towards the lagoon I saw a large seal swimming close to shore. I believe it was a harbor seal, the most common seal in Iceland. Earlier when we stayed at Berunes Hostel I got to see some seals, but not as close as this one. There were also a bunch of birds called arctic terns nesting close to the parking lot. I didn’t want to get a picture because they were attacking people. I still apparently got too close to one which flew at my head. We learned they attach the highest thing so you should hold something else above your head if they are close to you. They are impressive birds though because they migrate all the way from Antarctica to Iceland. The group then took a boat tour around the lagoon where we could get closer to the glaciers and learned more about the area. We could also get a better view of the giant Breiðamerkurjökull glacier. The lake has been growing because of the retreat of Breiðamerkurjökull, and is now the deepest in Iceland. Our tour guide brought some of the ice on board and we all got to try some. 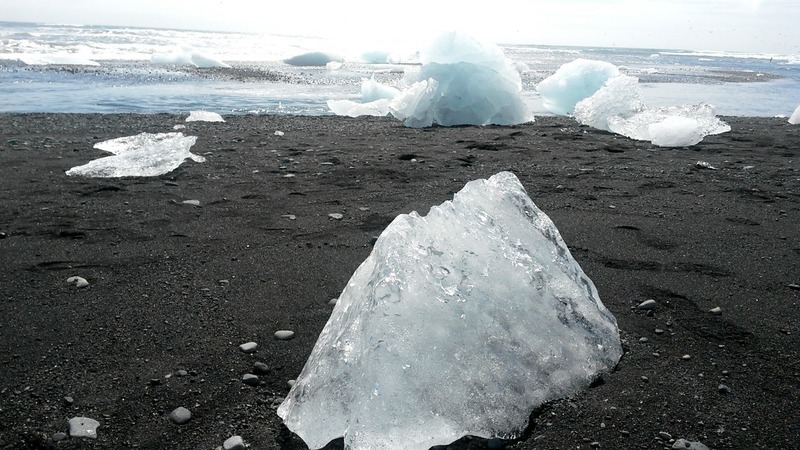 Glacier ice actually melts slower than ice from the freezer because the crystals in it are larger which exposes less surface area on the outside to melt. The next day after the tour we got closer to a different glacier when visiting Sólheimajökull, part of the Mýrdalsjökull glacier. It is a popular hiking destination and we got to stand on it. 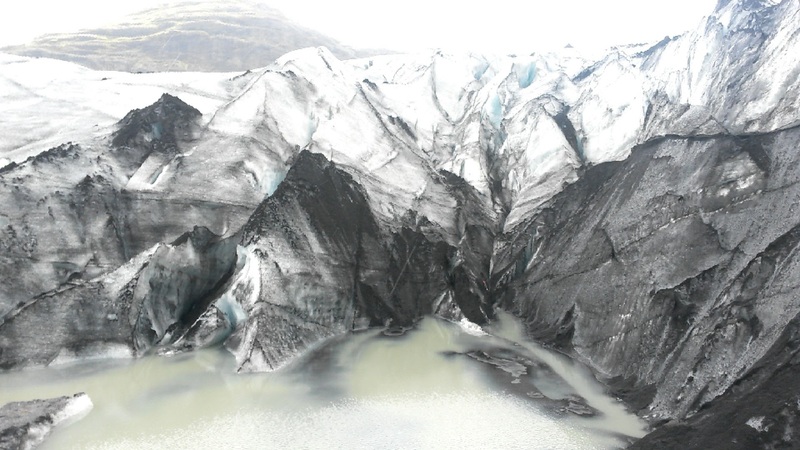 Part of the glacier was covered in black ash from a volcanic explosion. Our tour guide, Árdís, recalled how the glacier used to be right next to the parking lot but now it has melted so much we had to walk quite a ways to reach it. In the last decade it has receded approximately a kilometer. It was interesting to see how quickly vegetation was starting to grow in ground that had been covered with ice for so many years. I was glad I got to see it before it melted away completely. I had never seen glaciers before so this was a very unique experience for me. Watching all of the wildlife was probably my favorite part. With all of the beautiful scenery I could have stayed for a very long time.